With all of these recommendations in hand, we were prepared to fill the fridge on our first morning in Belize. Ken strapped on our backpack, we mounted the cruiser bicycles that came with the house we were renting, and headed out on the 2 km road to town. 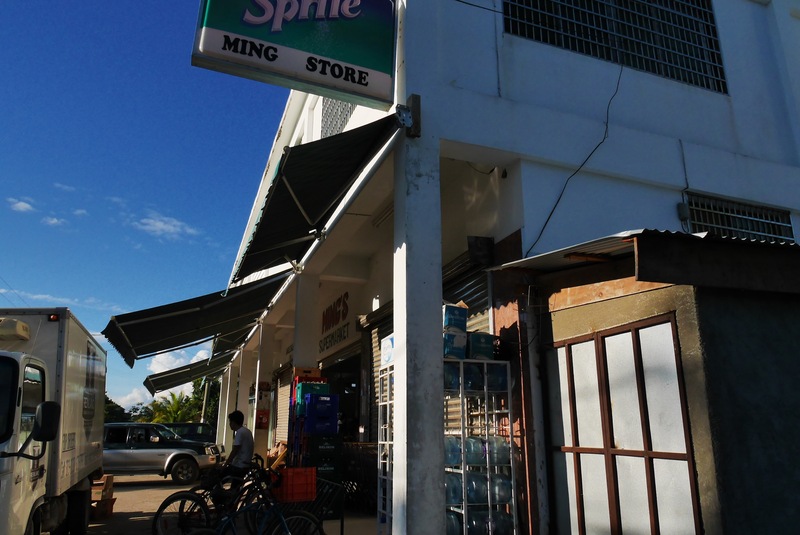 As we bounced over the potholes and roads-under-repair, we came across numerous grocery markets, including one I hadn’t read about at the beginning of town, and finally arrived at the one we think was Greg’s. Off to a good start, but we decided to keep going and come back to pick up our produce. After that, our quest was less successful. We found Omar’s, but no tortilla factory behind. We saw a sign for John the Bakerman, and followed it to where we thought it pointed, but we ended up at what we assumed was the pier. No John the Bakerman to be seen, no boats with fresh fish or Kevin. We locked our bikes, started down the sidewalk and came across the co-op, but instead of displays or baskets of fresh seafood as we expected, we found what looked like an office with nobody around. And still no Wallen’s grocery store. Again on our bikes, we retraced our path back through town and spotted a Wallen’s sign right across from Greg’s produce. We locked our bikes on a sign in front of Wallen’s and then tried to find a way in. On the door was an hours-of-operation sign, which we were well within, along with a closed sign. I must have looked puzzled because a local sitting at a table nearby came to my rescue. “They’ve closed down,” he offered. “They still have the grocery store, but not this any more.” I asked him when, and he said it had been a few months. When I went back to my internet sources to check details I discovered part of the problem – my two key references had been posted in 2010 and 2012. Most importantly, check posting dates of your Internet references. Traveler reports are fantastic resources, but the older they are, the less they should be relied on. The co-op is just up the sidewalk from the new pier (referred to by locals as The Bridge), across from Friends, a daytime cafe. 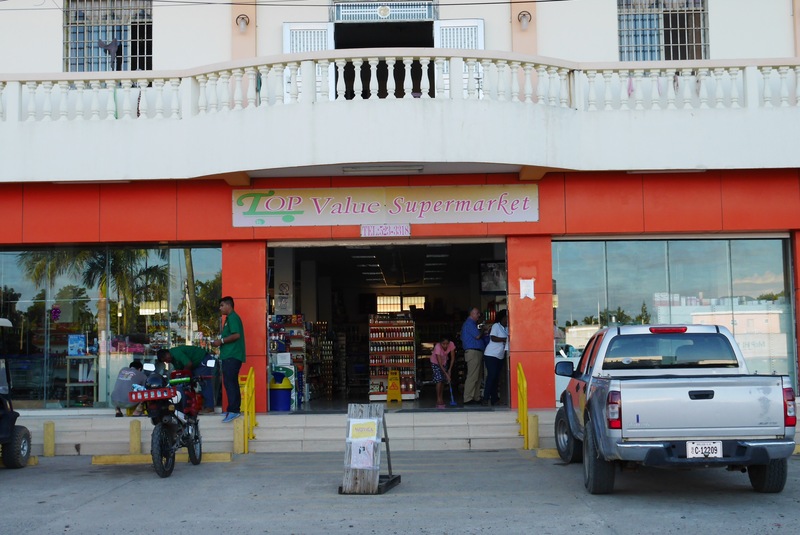 It is a good resource for conch, lobster, shrimp, crab, among others, but everything is frozen as soon as it is brought in to keep it as fresh as possible. You won’t typically find fish there as the fishers can sell it at higher prices off their boats or by marketing their wares as they walk up the sidewalk. There is no typical time when boats come into the dock except right after you leave, one helpful local told us. They had brought in grouper and snapper that morning but a boat later in the afternoon was also a possibility. Persistence, proximity, and patience are required, it seems. John the Bakerman is across from Omar’s and down the sidewalk a ways. There is a sign at the entrance to the sidewalk, but we missed it. We found him coming from the main sidewalk. John has been baking bread for 27 years. Step inside and see his ovens and rollers, and have a chat. He has mostly white bread, but is known for his cinnamon rolls and also has hamburger buns and a cinnamon raisin loaf. We asked him about whole wheat and he pointed to a bowl of dough his son had rising. We picked up a whole wheat loaf the next day. John let us know that we could also pick up meat pies there, made by his sister, from 7:00 – 9:00 am every day. We never did try the meat pies, but happened to be in town early enough one day to see a smiling young man selling John’s sister’s warm meat pies ($1) out of a thermal box under an umbrella, right across from Omar’s on the Main Street end of the sidewalk that leads to the little bake shop. We never did find a tortilla factory, but had amazing tortillas in the form of burritos ($3bz) at the little stand roughly across Main Street from the Tutti Frutti gelato shop. As it turned out, we had not found Greg’s. 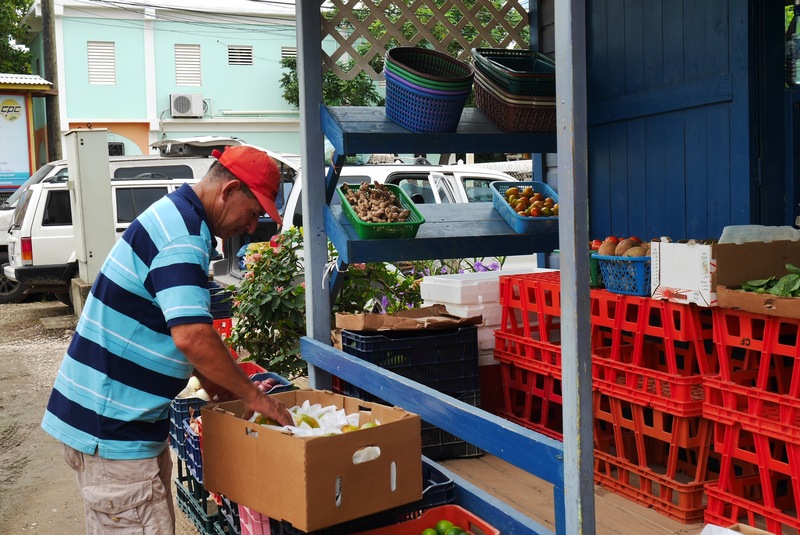 The man at the produce shop across from Tutti Frutti was really helpful and his produce was good. Nothing is priced, but you can ask. 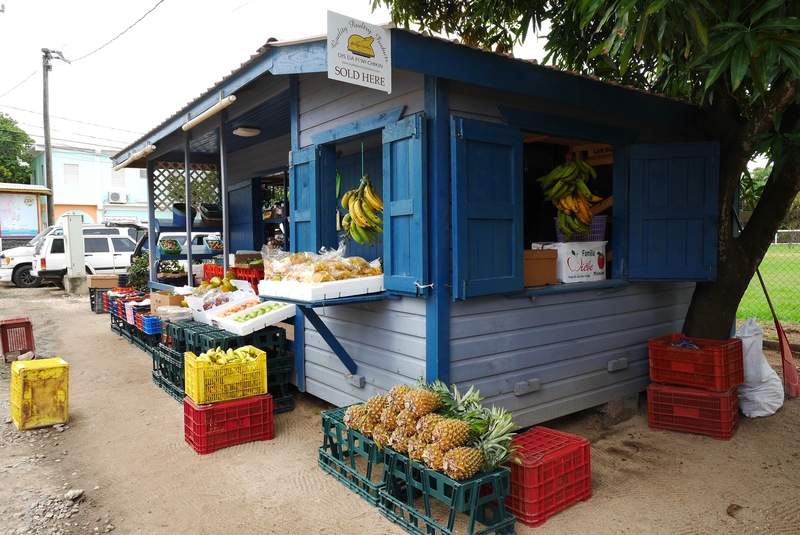 They also have fresh local yogurt, cottage cheese, and butter in the fridge, and a good supply of gold-wrapped Belizean chocolate bars as well. We tried, and enjoyed, the dark chocolate one, twice. When I returned to take a photo I asked if the shop had a name. I had finally found Greg’s. Yes, it used to be a truck, Carmelita told me and pointed to where it had been parked. Now it’s a little shop. They used to have a sign for Greg’s, but painted over it. And is there a Greg, I asked? Yes, she said, and pointed to the aforementioned helpful man. Our landlady recommended the first supermarket, Top Value Supermarket, or Mings. Both were fine. You can (and usually do) buy beer by the bottle, which is convenient when you only have a bicycle basket to haul your groceries home in. The going price seems to be $2 or $3bz a bottle. At Top Value you can also buy eggs individually, 3/$1bz (bring your carton back to save a little and reduce waste).